There’s no point in beginning this review with some sort of superfluous introduction. 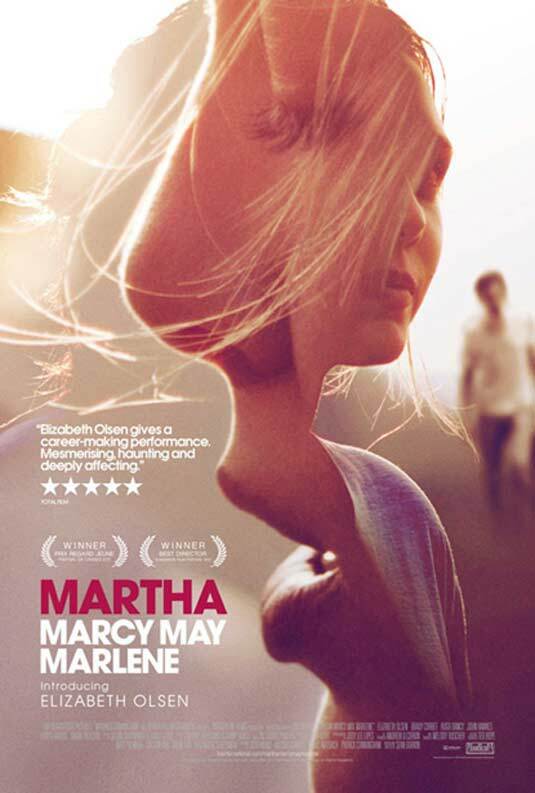 Martha Marcy May Marlene, directed and written by Sean Durkin, is a downright terrifying film driven by Elizabeth Olsen’s stunning performance as the title character. It’s the kind of film where what is terrifying slowly encroaches on you and you begin to question what was ever there at all. Martha Marcy May Marlene opens on a seemingly idyllic upstate New York farm. But there are glimpses of how life is different here. At dinnertime, the women eat cold cereal and only after the men eat a hearty meal. Both groups eat in silence. One morning a young woman, Marcy May, sneaks out and is chased through the woods as she races towards town. When Marcy May is confronted in a diner about her decision to leave, we get an inkling that something is off in her life. She calls her estranged sister Lucy and slowly, we learn the truth. Her real name is Martha and she has been missing for two years, living in a cult led by its enigmatic leader Patrick. The details of Martha’s life are revealed as the film weaves between two worlds: Lucy’s immaculate lake house and the farm in the Catskills. Juxtaposed with Martha’s inability to adjust to “normal” life are scenes showing how Patrick and the community he created attracted and seduced Martha. She becomes so indoctrinated, she can’t see the danger in the situation until it is too late. Even then, Martha can’t express to her sister what happened. The strained relationship between Martha and Lucy dominates much of the film. Lucy, played by Sarah Paulson, feels responsible for not taking better care of her younger sister and Lucy’s actions now are controlled by her guilt. Their relationship is a stark contrast to the other relationship haunting Martha’s life: her relationship with Patrick. John Hawkes is at his best as the controlling cult leader. Patrick controls everyone who comes into his graces. Young, impressionable woman find their way into his life and then he physically, sexually, and mentally torments them. Martha has been left broken and unable to articulate her anguish. In her quite wonder of a performance, Elizabeth Olsen captures every complicated and internalized emotion Martha experiences. She’s carefree and angry; scared and confused. She spends her days fearing whether or not Patrick is searching for her. That is where Martha Marcy May Marlene finds its most troubling material. Martha Marcy May Marlene does not reach any conclusions. How can it? Will Martha ever be able to function in the real world? Will the truth about the cult be revealed? This is a film that leaves you wanting more.